Illustration of transfer printed photonic crystal membrane lasers for silicon on-chip integration. Electrical engineers at The University of Texas at Arlington and at the University of Wisconsin-Madison have devised a new laser for on-chip optical connections that could give computers a huge boost in speed and energy efficiency. The team published its findings on July 22, 2012 in Nature Photonics. At just 2 micrometers in height – smaller than the width of a human hair – the surface-emitting laser's vastly lower profile could make it cheaper and easier for manufacturers to integrate high-speed optical data connections into the microprocessors powering the next generation of computers. Traditionally, edge-emitter lasers are considered as the candidate for on-chip optical links. But since mirrors are hard to form in such lasers and because the lasers occupy a large chip area, researchers have been challenged to find a practical way to monolithically integrate the mirrors on silicon chips. Surface-emitting lasers necessary for a high-speed optical links between computer cores could be 20 to 30 micrometers tall, slightly bigger than one hole in the mesh of a car’s oil filter. Yet the research team’s engineers say that on a 1.5-micrometer wavelength optically connected chip, lasers of that size dwarf their silicon surroundings. "It sits tall on the chip, like a tower,” says Zhenqiang Ma, a UW-Madison professor of electrical and computer engineering. “That is definitely not acceptable." Weidong Zhou, a UT Arlington professor of electrical engineering, says one challenge was integrating light into silicon chips, as silicon itself is not an efficient light emitter. Zhou and Ma have collaborated to shrink on-chip lasers in recent years with funding from the U.S. Air Force Office of Scientific Research, Army Research Office and Defense Advanced Research Projects Agency. As a solution, the researchers propose replacing layers and layers of reflectors necessary in the traditional distributed Bragg reflector laser design with two highly reflective photonic crystal mirrors. Composed of compound semiconductor quantum well materials, each mirror is held in place with silicon nanomembranes, extremely thin layers of silicon. Zhou says integrating compound semiconductor quantum wells with silicon is a promising approach. “We apply a nanomembrane transfer printing process to accomplish this goal,” he says. 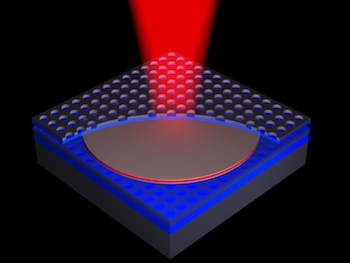 One layer of photonic crystal is equal to about 15 to 30 layers of dielectric reflectors found in conventional lasers. As a result, manufacturers could fabricate 2-micrometer-high lasers for data links with performance that could equal current designs. In addition to their larger size, reflectors for conventional lasers are made of materials grown only at very high temperatures, which means they can damage the chip they are placed upon during production. Since fabrication via transfer printing can occur at much lower temperatures, Zhou and Ma hope their laser design can be used to place optical links on silicon chips with much less wasted material, time and effort. Optical data links already exist at the largest scales of data networks – the Internet’s backbone is composed mainly of fiber-optic links between countries, cities and houses. But currently, that data moves over to slower metal connections and wiring as it travels from a regional hub to your house, your computer and eventually between the CPU cores within of the processor powering your machine. Through Semerane Inc., the Texas-based startup Zhou and Ma founded, the two hope to implement their production process in functional on-chip photonic crystal membrane lasers that could eventually be part of the next generation high-speed computer processors. “We believe this laser will be used to make data links more practically available,” Ma says. With widespread adoption of processors that use their laser design for optical links, Ma and Zhou could have a hand in increasing the speed along the local leg of the information superhighway. “Eventually, a CPU core in America could be connected to another CPU core in Asia, with optical connections all along the chain,” Ma says. Zhou's research is representative of the work under way at The University of Texas at Arlington, a comprehensive research institution of nearly 33,500 students in the heart of North Texas. Visit www.uta.edu for more information.